Mix together dressing first and set aside until sugar is dissolved completely. Cook pasta according to box directions and rinse under cold water until cool. Slice the sliced pepperoni circles in half and separate slices. 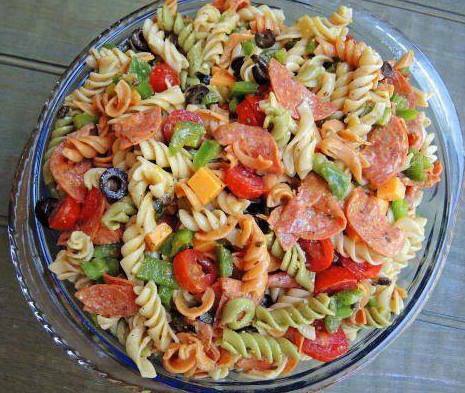 Mix together with pasta and chopped items, except the provolone cheese. Pour dressing over it all and mix well. Add provolone cheese to salad before serving, otherwise it gets soggy. You may have to add extra red wine vinegar or olive oil to get it to the desired consistency. Some people like it moist, others on the drier side. This is guaranteed not to last long before it is completely devoured!